Detail from Marc Chagall Four Seasons mosaic (1974) in Chicago. Continuation from PART ONE of this post…..
Upholders meet inner and outer expectations. They love rules, having a clear plan and are self-motivated and disciplined. Clearly tell them what needs to be done and they’ll lead the way. Questioners meet their own expectations, but resist outer ones. They need to see purpose and reason in anything they do. Make it clear why what you want from them is important. Obligers meet other peoples’ expectations easily, but struggle with their own. The must be held accountable by a friend, coach or boss to get things done. They thrive when they have a sense of duty and can work in a team. Rebels defy both outer and inner expectations. Above all, they want to be free to choose and express their own individuality. Give them the facts, present the task as a challenge and let them decide without pressure. Me, I am a Rebel through and through with shades of the Questioner, and this means that I must build in tons of flexibility and purpose to whatever task I have at hand. When I sit down to work, I have a list of options so that I can select a task (within reason and that meets my broader goals/deadlines) that suits my mood or answers a particular interest I am pursuing in the moment. Others, like Upholders are much luckier and can just start at the top of the list, or if you are an Obliger, you tend to do better when you are in a group challenge, or are promising to someone else to meet a deadline. Bottom line, you have to know yourself when it comes to why you procrastinate and be prepared to engineer success based on your work habits tendencies. Time will pass whether you plan for it or not…. This leads to the second evil— honouring limits. All of us have experienced that sense of total immersion in a project, where time and space evaporate and creativity reigns. And ironically enough, this immersion often comes after some period of procrastination, setting up that scenario where you are pulling all-nighters or inadvertently working well into other parts of your schedule, breaking the entire premise of Lesson #6. While this way of working can be useful from time to time, it is unsustainable as a long-term strategy and leads to a very out of balance life (I know this from experience!). Enter interval training or the Pomodoro technique— the practice of doing short and intense periods of work followed by rest and recovery. This lesson was so profoundly important to my sabbatical that I blogged about it earlier this year. The importance of interval training is that you are setting up the habit of coaxing yourself into work (which is half the battle) but then teaching yourself to pull away and rest (the other half of the battle). The result is balance and establishing the confidence to know that you are getting a bit done day by day instead of building anxiety around the expectation of one enormous work period. As I like to ask my students by way of metaphor: “Which is more productive? Going to to the gym for one hour, three days a week, for twelve weeks to build your body, or spending one whole week all day in the gym once every six months to meet those same goals?” I think we all know the answer. Interval training got me to where I am in the gym. As I learned this year, it should be no different in my work and professional life. I still remember the day that I discovered grocery home delivery. In fact, it still makes me giddy with delight just thinking about it. For me, grocery shopping— planning, making lists, driving, parking, shopping, unloading the car etc…— was easily 3-4 hours of my life each week doing something I loathed. Once I outsourced grocery shopping to a delivery service that allows me to shop online from a saved list and schedule drop off at whatever time suits my schedule, I clawed back several hours every week for tasks I would rather do. My point here is that it is worth looking into what tasks/obligations you can either unplug, delegate, and outsource. Whether it be hiring someone to clean your home a few times a month, or mind your child, walk your dog, or delegate some of your tasks (taxes, travel plans, etc..) to others, there is value in calculating the time and energy you gain in exchange for the expenditure. Another important aspect of this lesson is learning to saying no to invitations or requests that you would normally take on during the academic year. Now is the time to rescue hours in your day. This includes visiting your home campus during the sabbatical year (DON’T) or writing letters of reference (AVOID unless absolutely necessary) or agreeing to any form of committee work while on leave (YOU WILL REGRET IT). You get the picture. 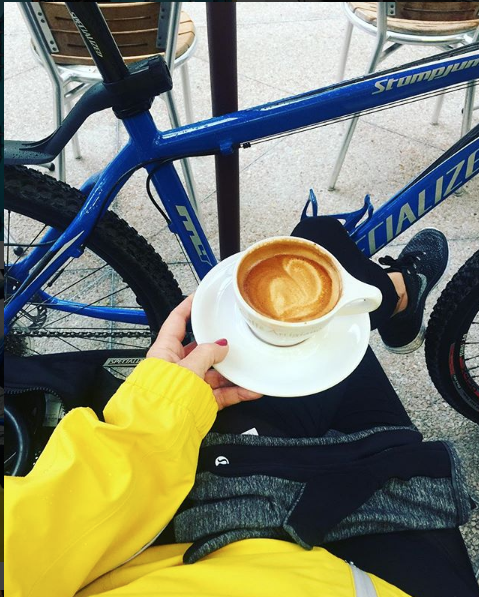 Unplugging, delegating, and outsourcing gave me more time to enjoy bike riding and latte drinking. But seriously, calculate what your time is worth and make some decisions to claw back precious hours in your week. The final lesson is the one I am currently working on and refining as I transition back to work— figuring out which of my habits and routines from the sabbatical year will find their way into my regular life. Importantly, I was already thinking about my return to work well before September, and had already began drafting imagined “back to work” calendars in late spring to envision what the new post-sabbatical me may bring. Three weeks into a new semester, I can report that most significantly I am maintaining and policing my fitness schedule, but have dropped from training five days a week to 3-4 days a week, depending on my grading and lecture prep load. I have also continued to schedule in time each week for drawing, reading for pleasure, and downtime. Sunday, especially, remains pretty sacred in this regard, and I try not to schedule any work on that day so that I can enjoy time with my husband and/or friends and loved ones. I have also looked carefully over the next twelve months for opportunities to work on my bucket list. My goal of acquiring my motorcycle license is in the works for next spring/summer, and I have two trips/mini-vacations planned, along with some other non-academic related writing goals. Above all, my sabbatical has taught me how to dial back the anxiety and stress I often experienced in the course of a regular academic year. Planning and boundary-setting have resulted in gaining some measure of control, and guilt-free time, in my day to day life. As a result, not only am I a better professor and researcher, I am also a more balanced individual.